This was awesome! I got this deal on gasoline while taking mom out to dinner today. 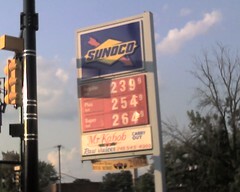 Twelve Mile road and Coolidge in Berkley (Michigaan). So I’m looking for a better land-line phone plan for my Mom (nothing higher tech than that) in Berkley, MI. She’s got nothing special right now but and I was looking at Talk America mainly for it’s wider local non-toll calling (a good chunk of SE Michigan). It’s about 22.95 with a wide non-toll area with toll calls for 7.9 cents and long distance for 6.9 cents (for $5 more you can get Call Waiting, Repeat Dialing, Speed Calling 8, 3-Way Calling, Call Return and Caller ID). She doesn’t do much that falls into those extra fee calls (and she could probably just use a phone card for those at 3.9 cents a minute) so I might just pick Talk America but I know I’ve seen them advertise better promotions in the past. I think it was cheaper when I got it and had 3 extra services included. Anyone know of any offers/promotions to switch? (I think she’s with AT&T now). So just a few days ago I was thinking about the Oakland County Child Killings from a few decades ago. I thought it was pretty bizarre that I even thought about it at the time. I was in a parking lot and I remembered trying to recall the type of they were looking for (at the time I couldn’t think of they name but it was a blue Gremlin, with a white stripe). I do remember thinking it was strange that I was even thinking of it and I’ve thought of it several times since then. I was on the way to the car, not from it, so I wouldn’t have just heard it on the radio (besides I’m pretty sure I was listening to a Laura Veirs CD earlier, it was my day off, so I didn’t need the traffic report). So here’s the extra strange part, I was googling around looking for John McElroy’s Automotive Insight show to see if they had an on-line feed (which I never did find) and I found this WWJ Audio Page with a link to a November 30, 2004 story about the killings. I’m 99% pretty sure it’s from the same day I was thinking about it. Coincidence? Or did I catch part of the story and not remember? or…? The car involved looked similar to the one on the right. It’s not exactly right, but I’ve really been thinking about this the last 24 hours and googling for more info and the car in particular (I think because I was in a parking lot). I’m thinking the model they were looking for that the white stripe was definitely thicker (I really remember the white stripe when I think back), darker blue and the car wasn’t as long (stubbier?) click the image for what I think is closer to correct but wasn’t clear enough to shrink. You do have to factor in memory stuff, both short term and long term. I had totally forgotten that they had found the bodies and while I remembered the other cities were close I hadn’t recalled how close (right next door practically). More info on the old case: WWJ, Oakland Press and Click on Detroit. Don’t know how long these links will last but this google search seemed to find quite a bit on it. 6. You are given the gift of an original oil painting by any famous artist. What painting would you choose and why? 5. Last week, the Reader’s Choice question asked you to identify your favorite movie line. Later this month, the American Film Institute will list the 100 Greatest Movie Lines of all time. Which one do you expect to win? 4. You have the ability to snap your fingers and be instantly transported to one of three places whenever you wish to go there. Which three places would you select as your destinations? Costa Rica (probably Jaco, since I like the ocean there), London, England (I always enjoy England) and Berkley, Michigan (most of my extended family lives there) and work (I hate wasting time driving to and from work). Yes I picked four. I’m assuming you can teleport back to your starting point which would be home. If I had this power I’d probably move to one of the locations (probably Costa Rica) and make that home so I’d only need the three other destinations. 3. What is the most embarrassing question you’ve ever been asked? Hmmm… I don’t embarrass easily so nothing comes to mind. Probably when I was younger when someone would ask me if I liked (insert some girl’s name here) and I’d be embarrassed about it. The bonus about embarrassing questions is you have the bonus of asking the same thing back. 2. Which business do you have the longest continuous relationship with: your bank, your auto insurance provider, your home telephone provider, your cellular phone provider, or your cable company? How long have you been with them? My bank (credit union), I’ve probably been with them since 1988(?) and I’ve never seen a back with anything even close to the same services to make me consider changing. They are 100 miles away and with the Internet and a toll free number it’s like there right here. 1. When was the last time you looked your significant other in the eye and told him or her how much they mean to you? Not having one right now I can’t really answer this one. $100,000 must be donated to charity. What charities will you support? Probably the two different shelters and the crisis hotline that I’ve volunteered for. $100,000 must be given to one person that you know. To whom do you give it? What would you expect him/her to do with it? Would you put any restrictions on its use? Would it make a difference if you could make the donation anonymously? $100,000 must be given to someone who has recently been in the news. Who gets it? Why? Hmmm… I don’t watch/read enough news and everyone I hear about is bad… I’m sure I could find some deserving person/family who’s had some hard times, or needs something to get their business back together. $100,000 must be spent on a public beautification project. You can build a park, commission artwork, etc. What do you do, and where do you do it? There is a boring little park down the street that would be nice if it were redone maybe something with that. $100,000 must be spent on a memorial to someone/something that you have loved and lost. What form does the memorial take? Who is it for? The Frank Hill memorial computer lab / reference center for the Berkley Public Library (with WiFi). Grandpa got me interested to think about things: science, technology and to read a lot. I remember going up with him to that library when I was a kid. $50,000 must be spent studying something you have not formally studied. What will you study? Astronomy, I always wanted to understand it better. $50,000 must be spent establishing a scholarship. What’s it for and who will you name it for? $50,000 must be given away in a contest. What kind of contest do you hold? A Michigan teacher web site contest. We’d supply space or they could use their own. They keep the site up for one school year. At the end we give five $10,000 prizes. Best content. Most updated (with real content). Best Design. Best Page/Post. One random (as long as they actively used it for a whole year). $200,000 must be spent doing as many things as you can on your “lifetime to do list.” Always wanted to see Alaska? Take a boat trip on the Rhine? What things would you do first? Travel like I never have before (and it’d all be first class! ), some cruises, Paris, Egypt. Having a child is one my list so I’d be working on that too! That leaves you with $150,000 of mad money. If the rules say you can’t spend that money on things that might be termed “practical,” what do you buy on your spending spree? Geek out the house with more gizmos and such. Probably the same for the car (DVD/MP3/Player). One of those new infrared outdoor grills. TiVos, iMacs and home theater systems for all my family and friends. One of those cars that will go in the water like a boat. There isn’t much I need but I’m sure I could figure out a way to spend it. UPDATE: December 2004/June 2005. I just came here to update this. I can’t believe how much it has not changed. The only other things are I’ve been liking my iPod (and listening to podcasting), the Scene It? DVD games and maybe some additional music groups (Katy Rose and maybe a few others) and I won’t add them until they’ve been around a bit longer. Probably “Two and a Half Men” (I laugh SO hard) and Liz Phair (added). http://GarySaid.com/tags/berkley/ generated Friday, April 26th 2019 at 9:54:28 am EDT (in 132 queries in 0.773 seconds).